Elise Durenberger is back with a mixed media project to share with us today. OK...seriously LOVE that quote! It definitely sounds like something my mother would say. 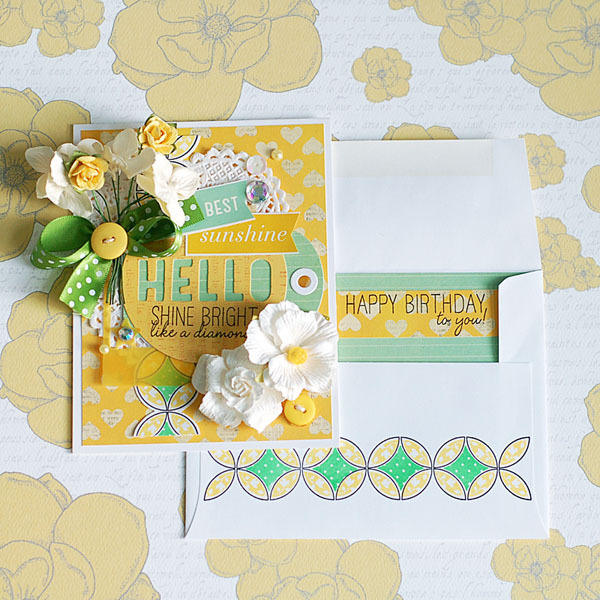 The Folk Art Alphabet die paired with the Blanket Stitched Blooms looks awesome with the crepe paper sun rays in the background. Elise is always so incredibly creative, you'll have to head over to her blog to get all of the details on this baby. We're back with another mood board! This one is one of my favorites so far. You'll find this color combo in almost every room of my house with another splash of color thrown in. It's the perfect base to start with in my opinion. We are going to leave this mood board open for 2 weeks to give you more time to play along. The Design Team has been taking turns sharing their April/May 2013 release projects with us, and today kicks off Elise Durenberger's rotation. Over the next 3 days she will have plenty to share and inspire us with. Check out this fun layout. 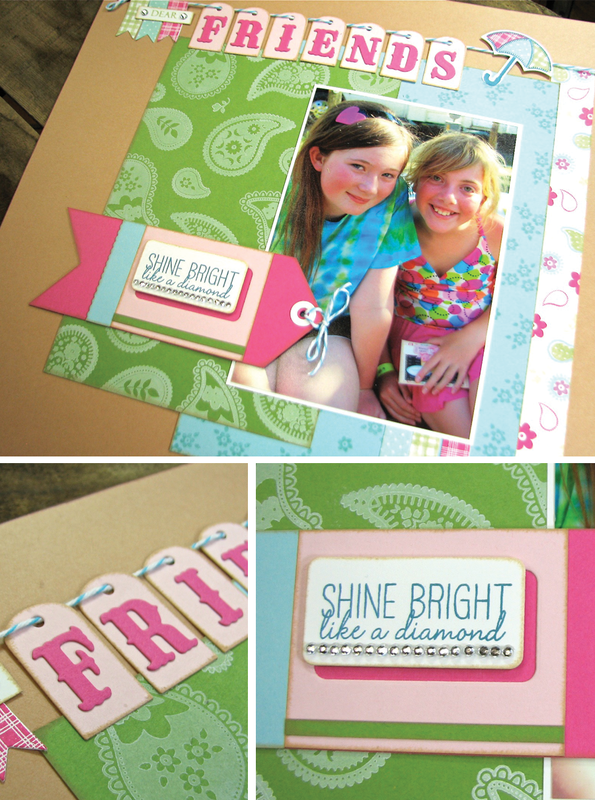 Bright colors, fun patterns and big smiles...perfect combo for a layout capturing and celebrating friendship. I love how Elise used Paisley Patterns to create three different background patterns on her vertical patterns to ground her picture. 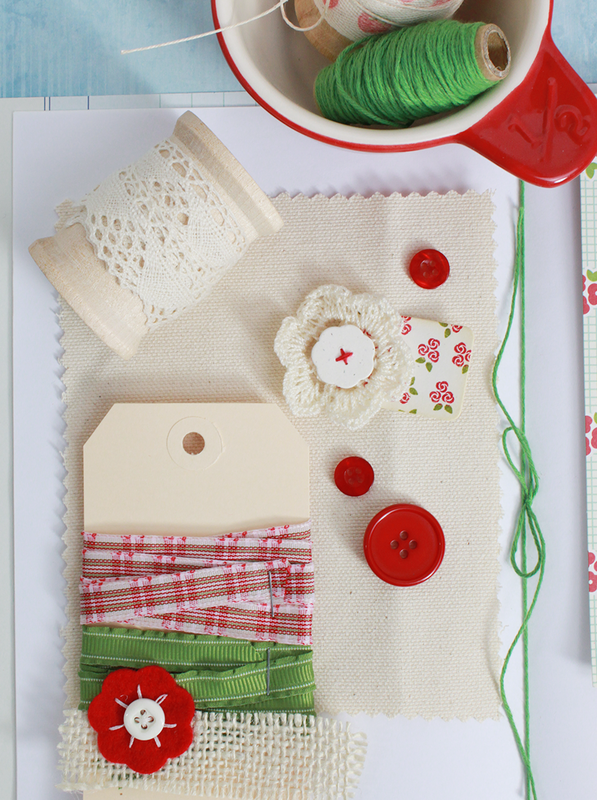 This is a wonderful set for creating your own patterned paper. With so many images included in this set, you'd never get bored or run out of patterns to create. The Folk Art Alphabet die is a great size - perfect for using on either cards or layouts like Elise has done here to create her title. 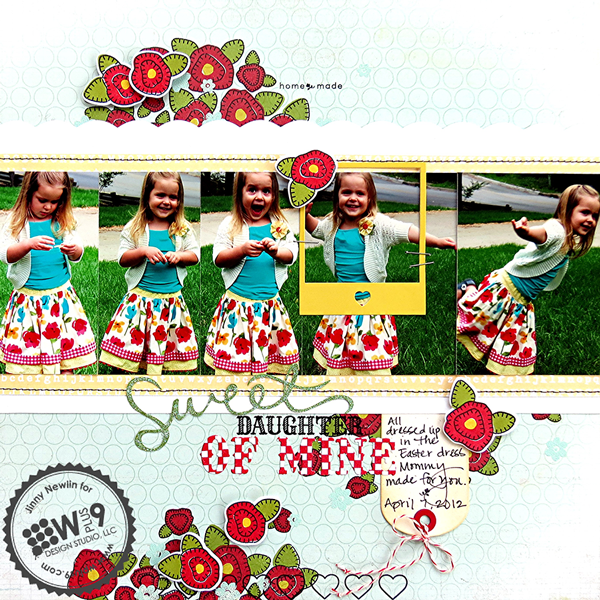 And the little banners that she added using the pattern blocks from Country Charm are a great addition. I hope you've enjoyed Elise's layout as much as I have. Be sure to stop by her blog for more photos and all of the details. And join us again tomorrow to see more from this talented lady! 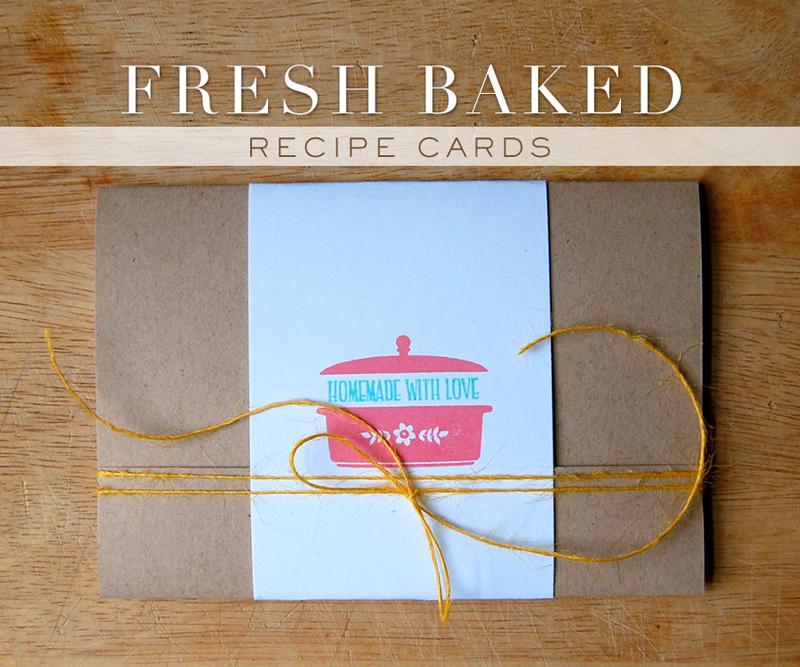 Today Lea is sharing a gorgeous gift idea featuring Fresh Baked with us. Somehow gorgeous just doesn't seem to do this justice though. I am head-over-heels in love with this little number. 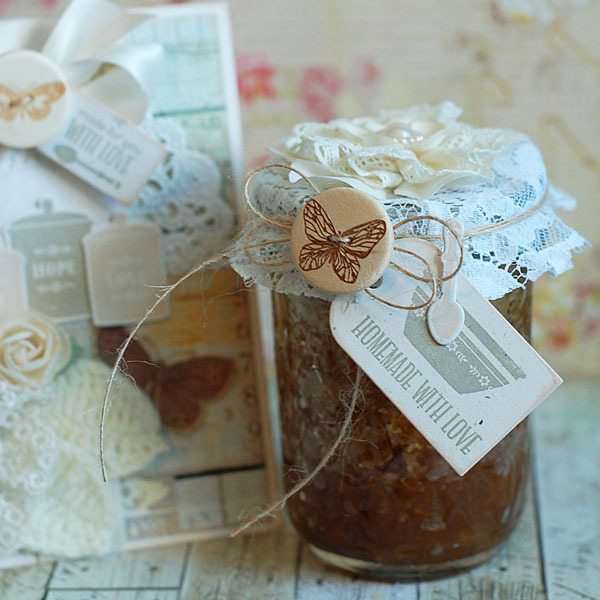 The sentiments and images from Fresh Baked are just the right thing to dress up this jar of homemade sugar scrub. The soft colors and addition of lace and roses evoke femininity and just seem proper for a little gift of pampering. Don't you think? Do you love this as much as I do? Be sure to stop by Lea's for all of the details and the Vanilla Sugar Scrub recipe. Thank you so much for inspiring us over the last couple of days Lea! Lea's back with more to share with us today! 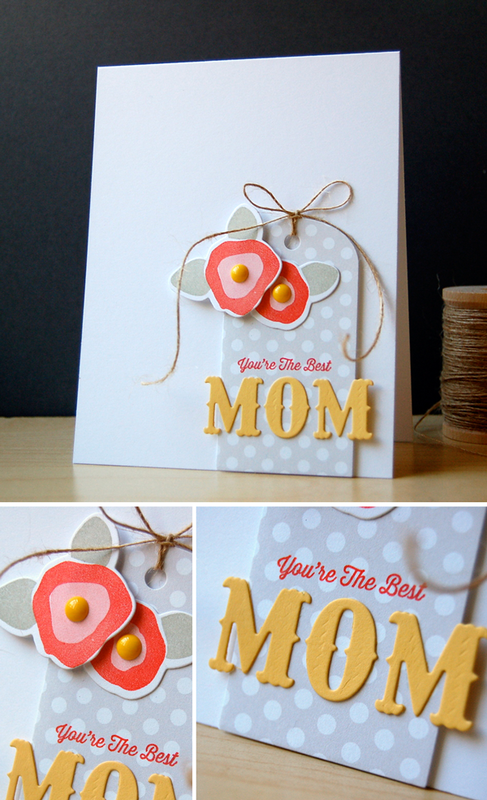 And this time it's a pair of Mother's Day appropriate cards. 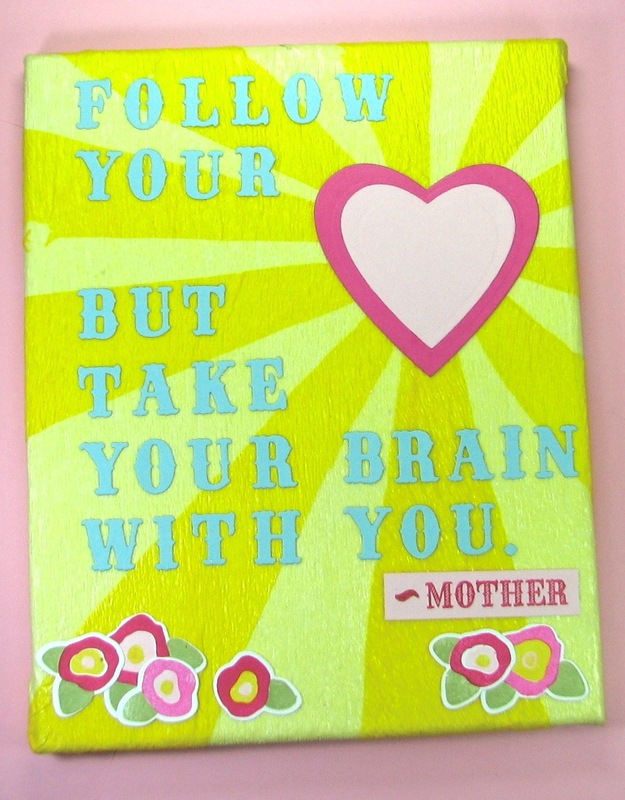 It's coming fast, and I don't know about you, but I tire of the same sentiment for Mother's Day over and over. 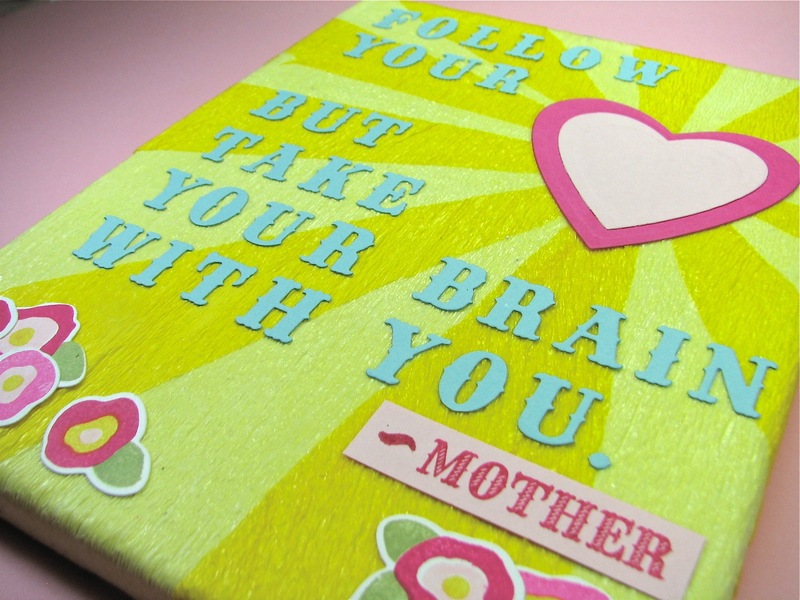 Why not try a sentiment that celebrates those moms out there? Encourages them to shine...because it is their day, right?! 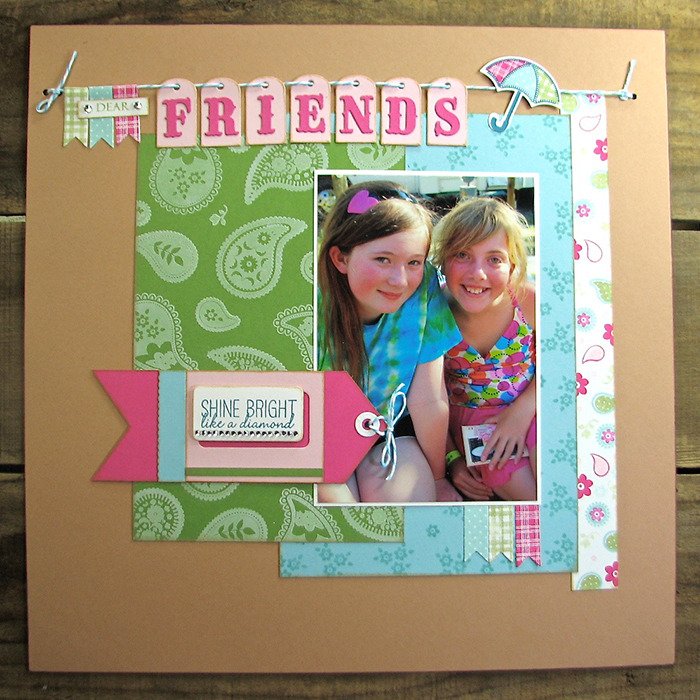 I hope you've enjoyed today's featured project, be sure to stop by Lea's for all of the details. Lea will be back again tomorrow with one last project, and it's a cute gift idea you won't want to miss! 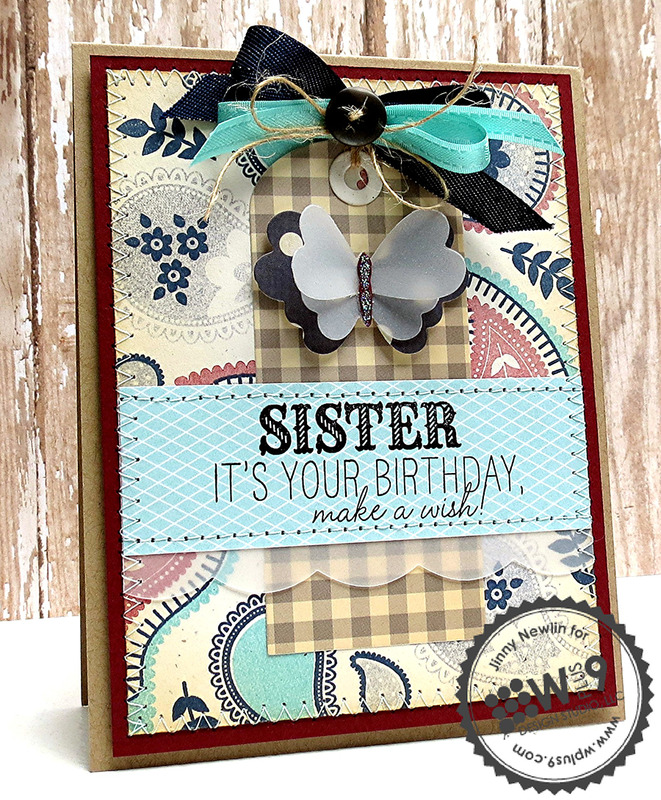 It's Lea's turn to share her release projects with us, and today, we have an especially cheerful birthday card. What an amazing display! Go ahead, take your time, look it over and take it all in. I'll wait. Can you believe how much Lea's packed into this pint sized canvas? Yet somehow she's managed not to overload it. Some of the things that I particularly love about this duo. One - the envelope. Love the stamping and decoration on the inside that just peeks out at you. Two - the mix. 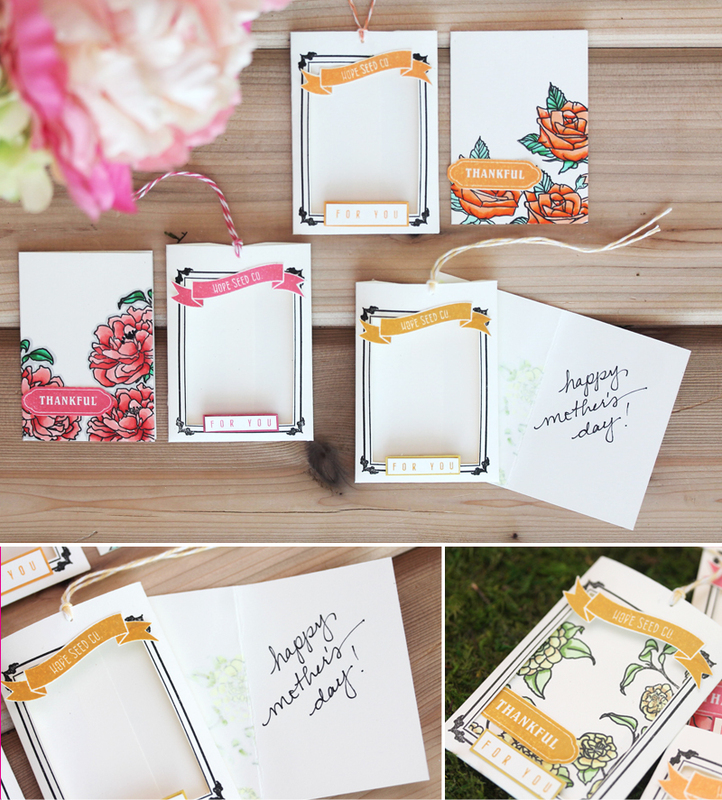 It's such and eclectic mix of feminine florals, modern fonts, and homespun quilting patterns. but. it. works. Never in a million years could I pull it off. Three - what a color palette. Oh yes, bring on summer already! 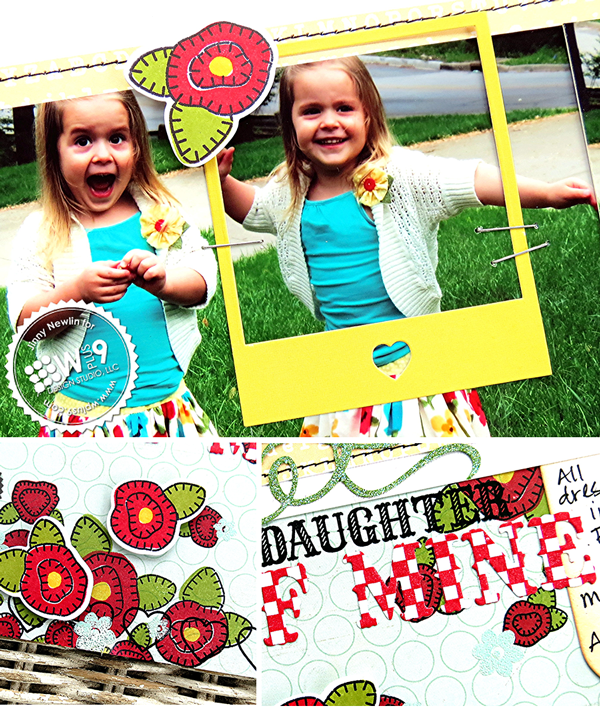 I hope you've enjoyed today's featured project, be sure to stop by Lea's for all of the details. And, don't forget to stop by again tomorrow for another Lea original! Cristina is "wowing" us with some Mother's Day appropriate cards today. Check out this pair of complimentary cards featuring Blanket Stitched Blooms that has both mom and sister covered for the upcoming holiday. This is a perfect example of how stamping the flowers from this set without the stitched borders takes this set from a little bit country to a whole lot of modern. Pair it with trendy angles and classic polka dots and you've got a solid design that screams sophistication. Even the Folk Art Alphabet dies get a boost of sophistication. LOVE every.single.thing. about this duo! Thank you so much Cristina for sharing with us over the last few days. I hope you all have enjoyed her release projects as much as I have. Next up with have the very talented Leah Lawson, you won't want to miss her's either, I promise! This week's mood board was pulled directly from the photo. I fell in love with the old weathered shutters on this building in Marathon, FL. I pulled out a couple of different mediums to try and replicate the look on a few tags and a set of notecards. 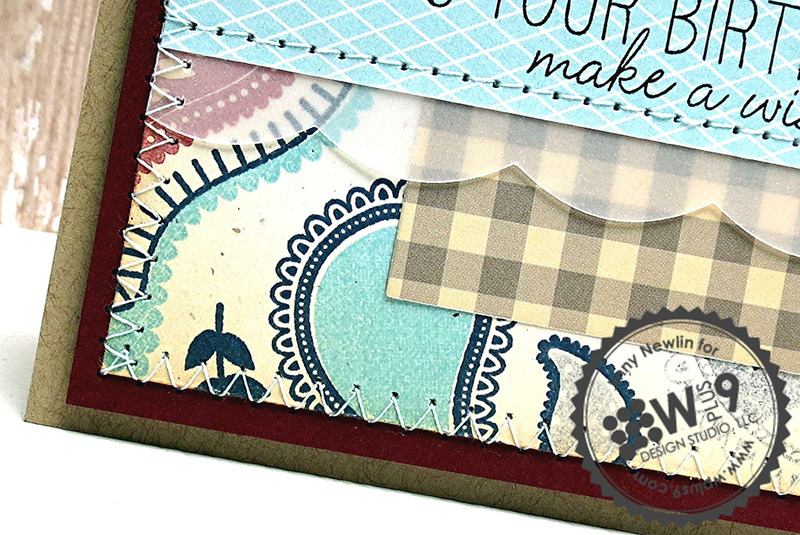 Cristina is back again to share another project with us featuring the Fresh Baked stamp set. 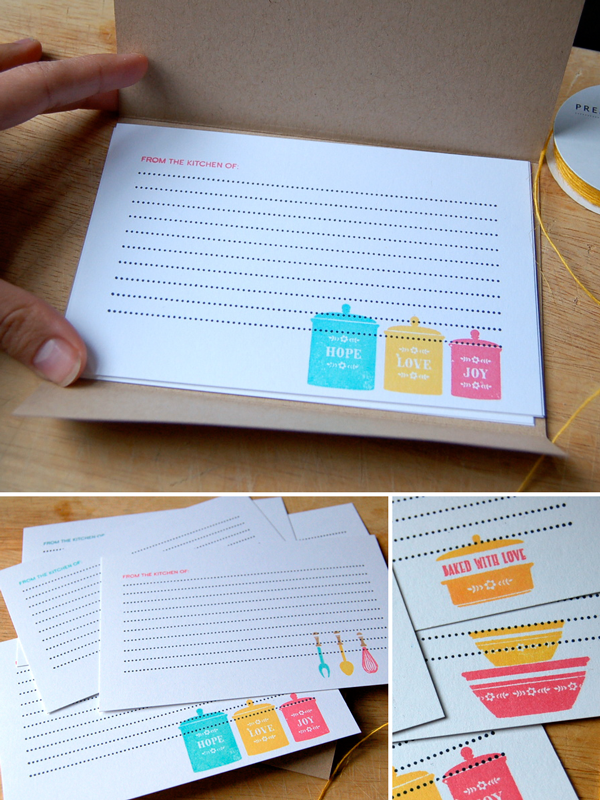 Check out how she's paired this versatile baking themed set with From The Kitchen Of, to create a little recipe card portfolio that's perfect for gift giving. I don't know about you, but this would be perfect for me to accompany some of those homemade treats for gifts during the holidays. Be sure to stop by her blog for more details on this project. I'll be back a little later with a new Mood Board Monday post, and Cristina will be back again tomorrow to share more with us from our April/May 2013 release. See you there! Are you ready for some more inspiration from the Wplus9 Design Team? Cristina Kowalczyk will be with us for the next few days providing some serious CAS inspiration featuring our April/May 2013 Release. Holy cow, does Cristina know how to hit the ground running. Leave it to her to come up with this clever use of Quilt Prints. What a great job of showing just how modern and graphic this stamp set can be despite it's namesake. I'm usually pretty good at stamping an image twelve ways from Sunday to see all of the potential possibilities, but I did not think of this one. Pure graphic perfection. Want to see exactly how she created this awesome pattern? Head over to her blog where she'll show you how she did it. Thanks for stopping by today, be sure to come back tomorrow to see more from Cristina! 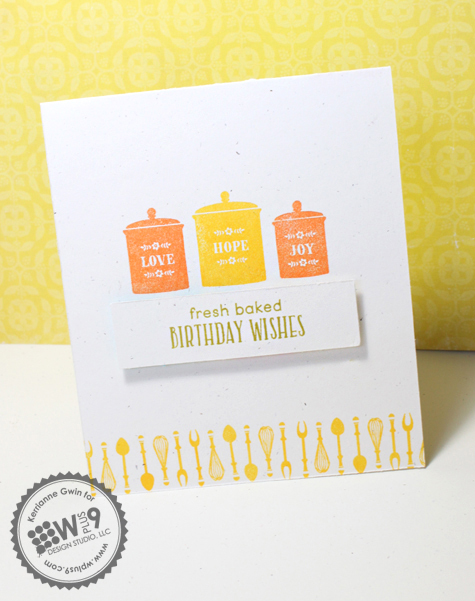 Jinny Newlin is back with one last featured post using Fresh Baked. And she has cooked up a little something for us that looks delicious. I am seriously so impressed by this display of color. I am usually a "neutral - with a pop of color" kinda girl and find it difficult to make this many vibrant colors work well together. But not Jinny! These colors compliment the retro images in Fresh Baked fantastically. And of course, if your card is touting something "fresh baked", you might just be handing over something fresh from the oven. Fresh Baked along with Timeless Tags 2 has got that covered. 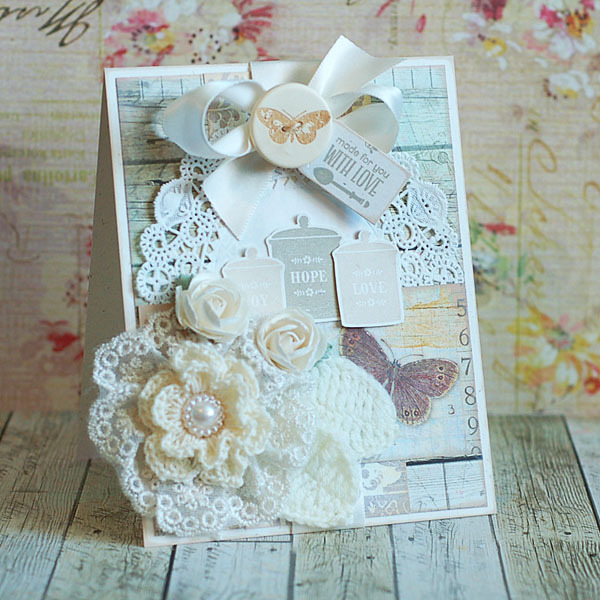 Such a great set for cards and gifts, as Jinny has shown us today! Thanks for stopping by, I hope you are having a fantastic week! 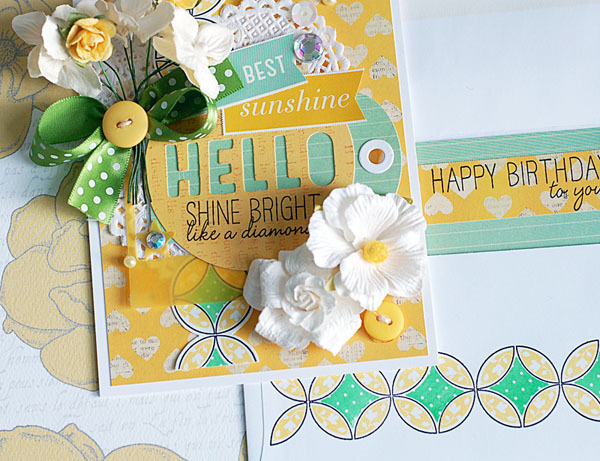 Design team member Jinny Newlin is back today with a fresh and summery layout featuring products from our new release. I always, always, always look forward to Jinny's layouts. She never fails to incorporate product in the most clever ways, without it looking forced. Seriously?! Can it get any cuter?! 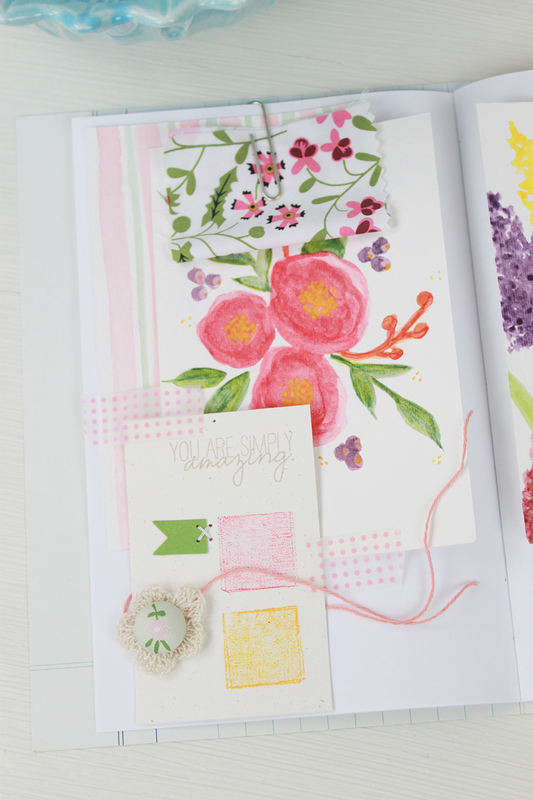 Love the cascading of flowers across the page and the little overflowing piles. And how perfect does Blanket Stitched Blooms look with that skirt? But I guess it is kind of impossible not to have a cute layout with a face like that, huh? See what I mean about clever and never forced? Notice how Jinny mimicked the flower brooch in the upper left hand corner of her photo frame? She's carried the checkerboard pattern from the skirt down to the die cut letters in her title. Even the tag shape that she's used for her journaling mimics the curve in the cardigan. Told you, l.o.v.e. As if the layout wasn't enough, did you read the journaling? Jinny made that dress?! Say what?! Talk about talent! Thanks for stopping by today, I hope you enjoyed! Jinny will be back again tomorrow with more for us! 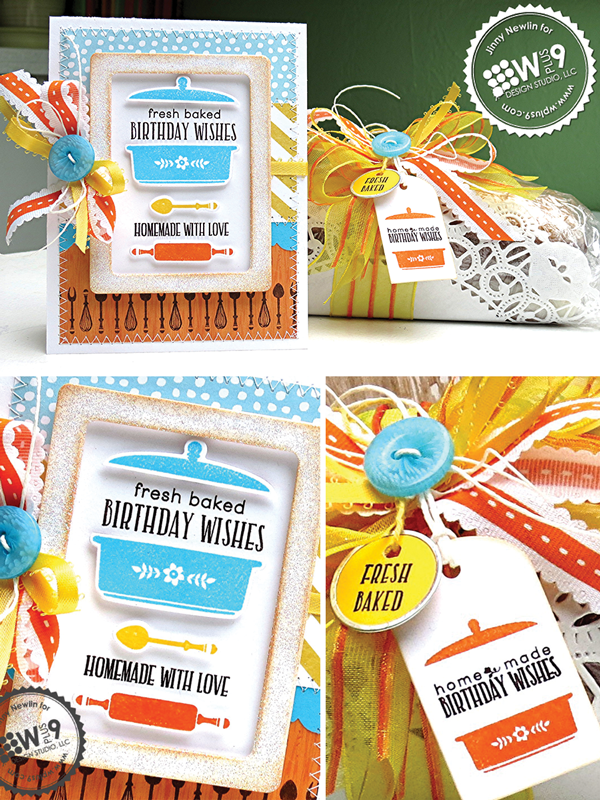 Design team member Jinny Newlin will be with us over the next few days featuring products from our new release. Jinny has a homespun, bordering on country style, so I was extremely excited to see what she would do with Quilt Prints and Paisley Patterns. She did not disappoint! 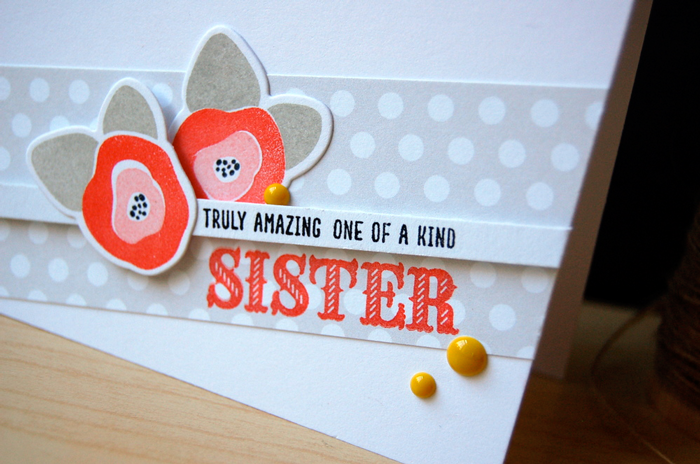 Such a gorgeous card, and her color combo is perfect. 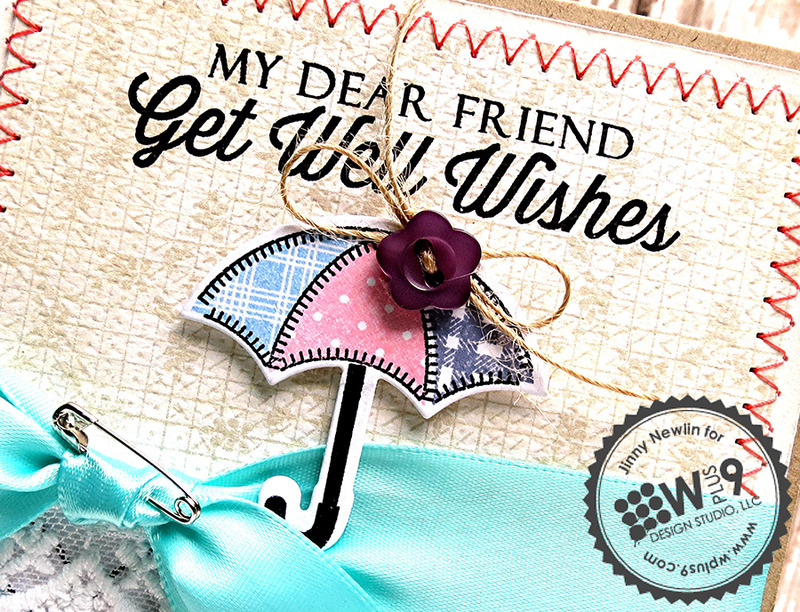 And how clever to use the "Get Well" sentiment with the umbrella image. Goes along with the old saying "feeling under the weather" when someone is sick. Why didn't I think of that? Jinny's next card is just as fabulous. Just check out her background stamping! Aren't they amazing?! Be sure to stop by Jinny's blog for more details on today's featured projects, and leave her some love while you're there! Well, well, well...fancy seeing you here! There are some of you that I probably know and there are some that I've never met. Either way, I'm excited to be here at WPlus9! Hold up...rewind...let me start at the beginning: My name is Amber. I blog about crafty stuff and I have a serious DIY problem. You can find me at Damask Love where I spend most of my time making stuff with paper and adding in a little sassy commentary from time to time. For the next few months, you'll find me here...outside of my 'hood - contributing to the WPlus9 blog in an exclusive series of posts that I'm calling "Outside the Box." Here, I'll be using WPlus9 products to inspire you to dress up gifts and more. I hope you'll join me as I hijack the blog once a month, on the 15th! And once you're done here, be sure to visit me at my own blog where promise to have even more crafty goodness. To kick off "Outside the Box", I have a project that features one of my very favorite stamp sets: Hope Seed Co.. In the spirit of full disclosure, I should tell you that I have a floral stamp addiction. I love them all...and WPlus9 does them incredibly well. 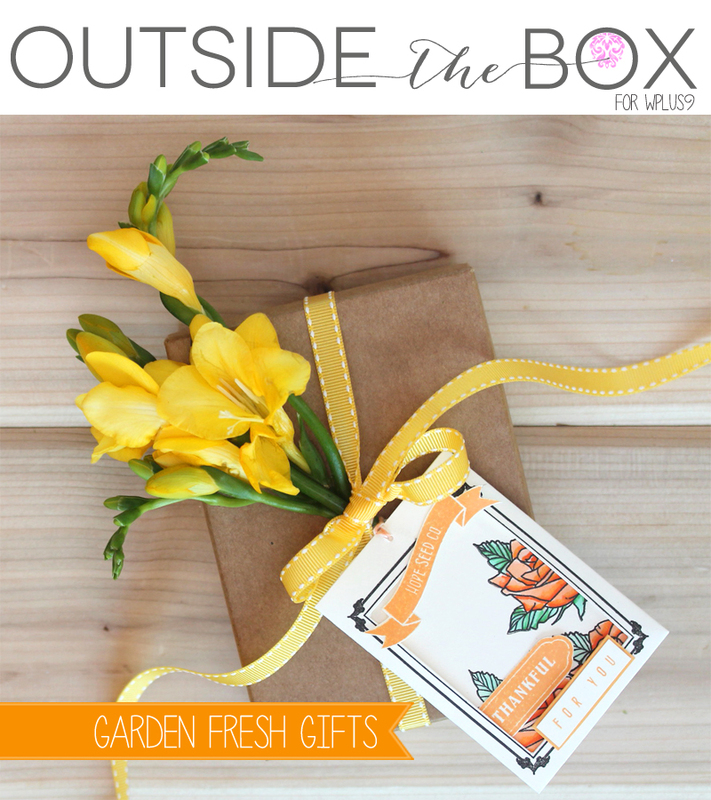 With spring upon us, it only made sense that I combine my love of florals with my love of packaging and create this simple but beautiful idea for dressing up your gifts. With Mother's Day coming up, there's a good chance we'll all be purchasing a bouquet to give to Mom. Why not forgo the bouquet and add fresh flowers to your gift instead. It's a simple way to create a different garnish for your gift. The approach is simple. 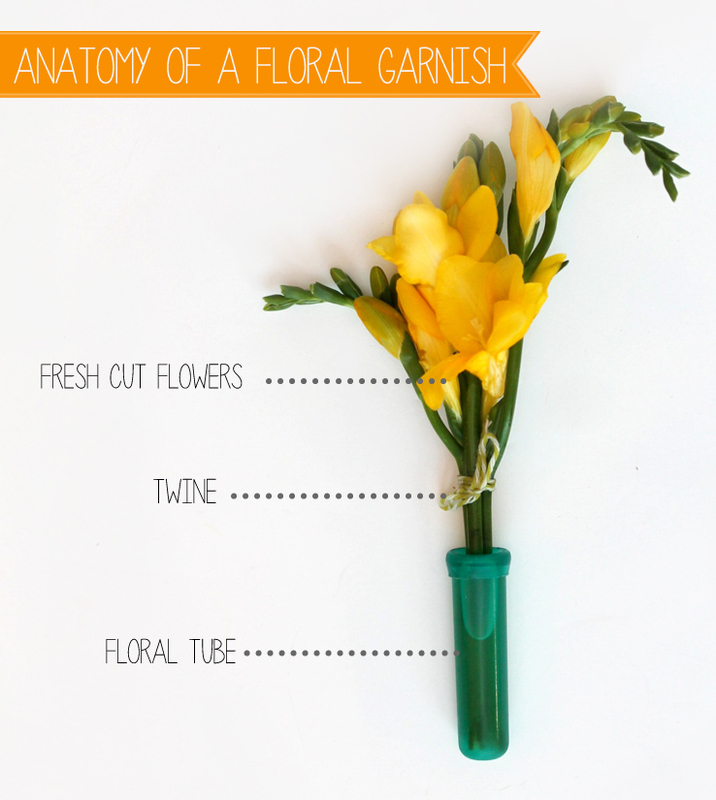 Simply assemble your fresh flower garnish as shown. The purpose of the floral tube is simply to keep your blooms alive and pretty until you're ready to give the gift. Just before you hand it over, remove the floral tube...because, let's be honest...it's not all that pretty to look at! 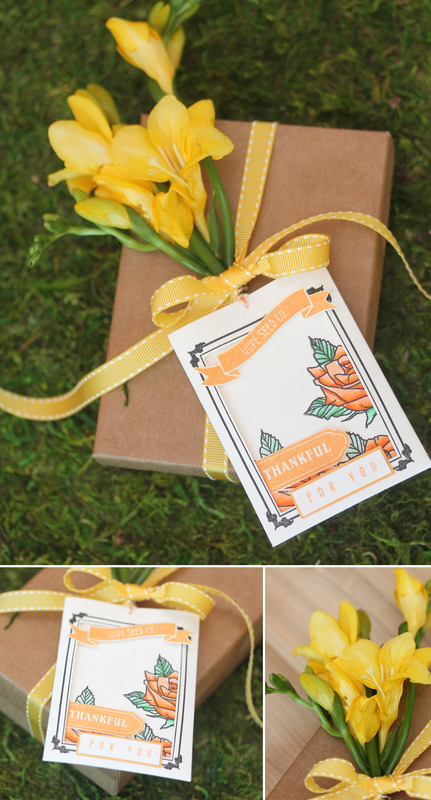 The Hope Seed Co. stamp set adds the perfect coordinating accent for this gift packaging idea. 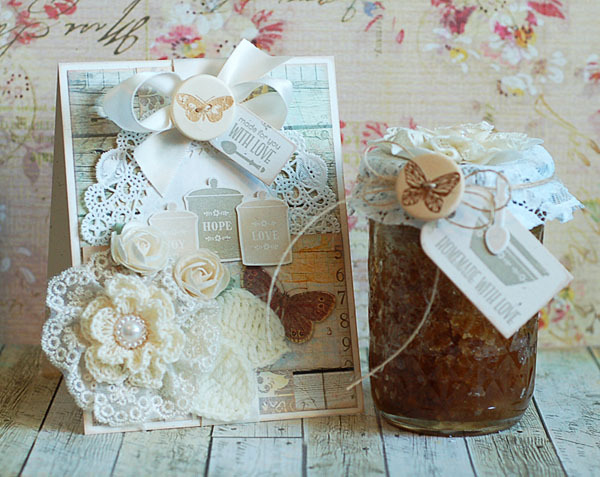 The seed packets and floral images work beautifully as tags. To create these, I trimmed out the center of the seed packet die and trimmed off the top flap as well. 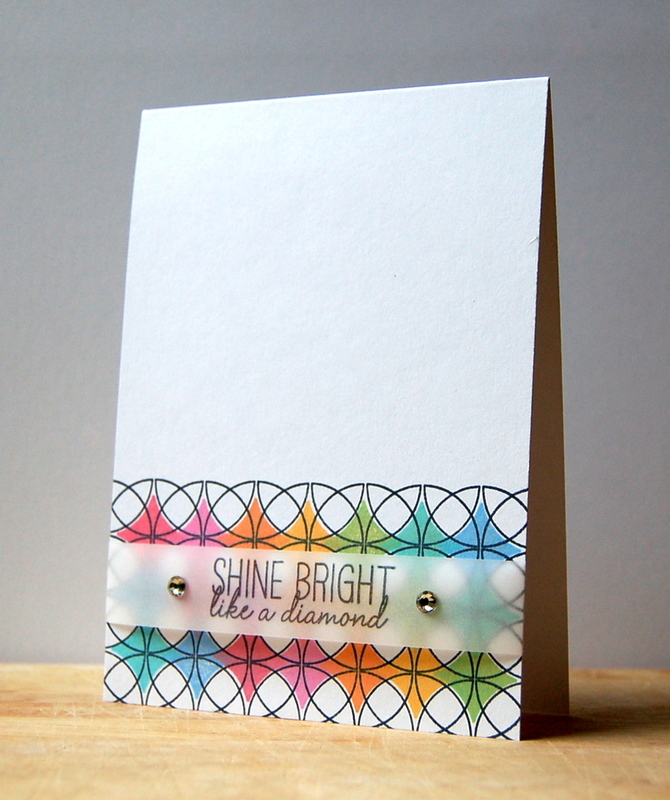 Inside of each tag envelope is a mini card that I stamped and colored. 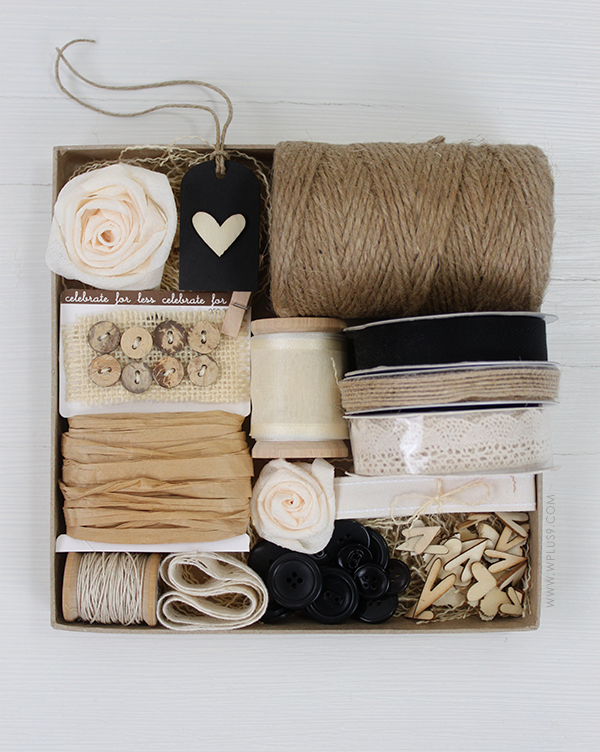 A quick piece of baker's twine makes it easy to tie these on to your gift. With this as inspiration, there's really no stopping you when it comes to creating fresh floral gift garnishes of your own! Thank you so much Amber for joining us today, and can I just say that we'd let you hijack the blog anytime! 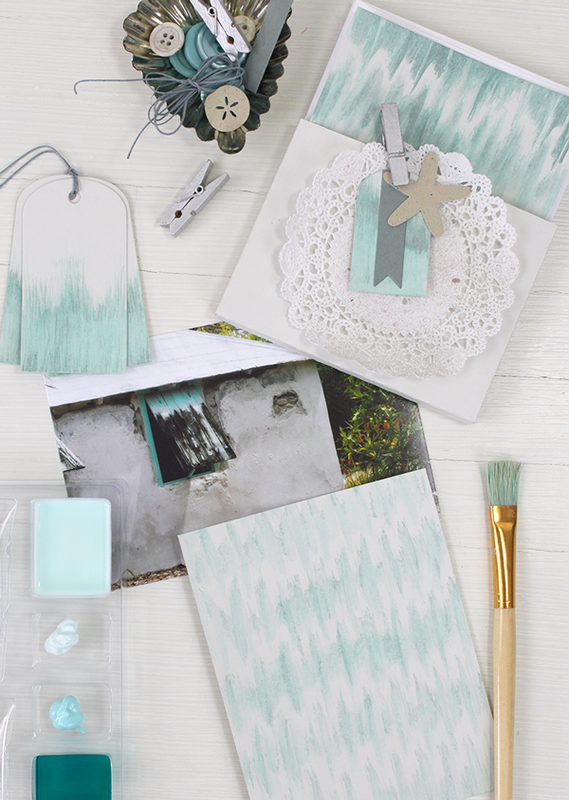 Be sure to head over to Damask Love for more crafty inspiration, you won't be dissapointed! This week's mood board just makes me feel content and happy. It's what I might imagine you'd find in the kitchen of a country farmhouse. A little rustic, simple, humble and homey. Jean here, with another post for WPlus9 Design Studio. Today, I have something fun to share that I've been wanting to do for quite a while now. I was inspired by the incredible DIY party sets and buffets I've been seeing via Pinterest and decided to give it a try. 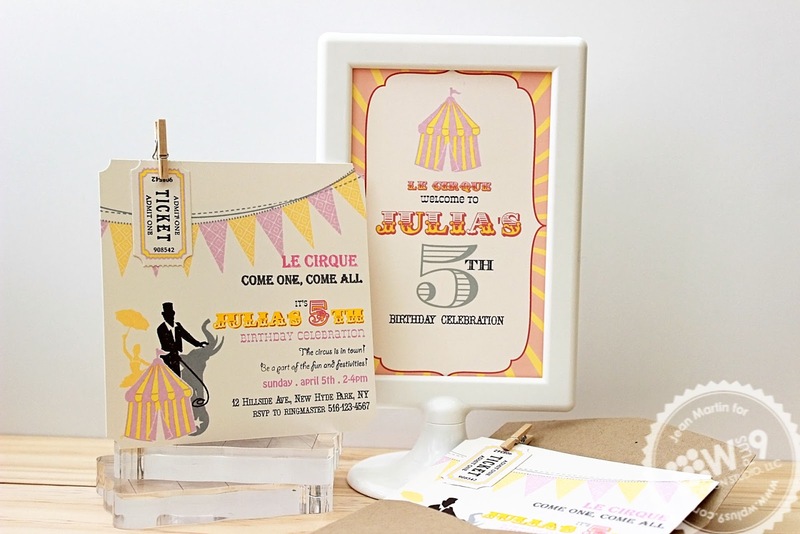 Le Cirque is the perfect set to bring my own to life. 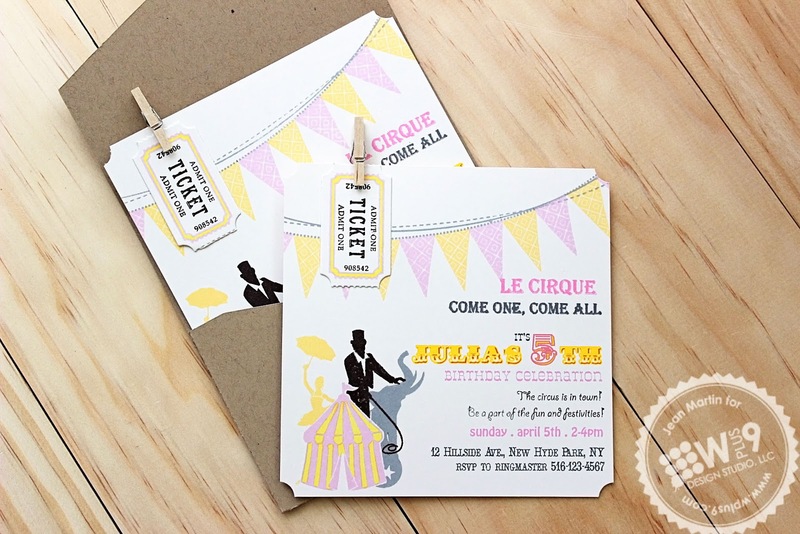 Design and print invitation details onto white card stock. Cut to size. Prep by punching corners etc. at this point if you choose. 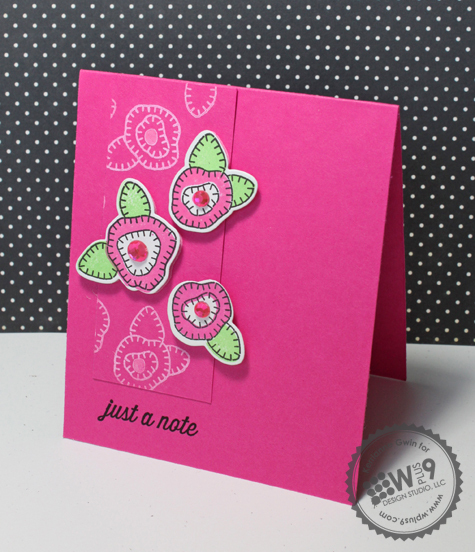 Add stamping and embellishments. 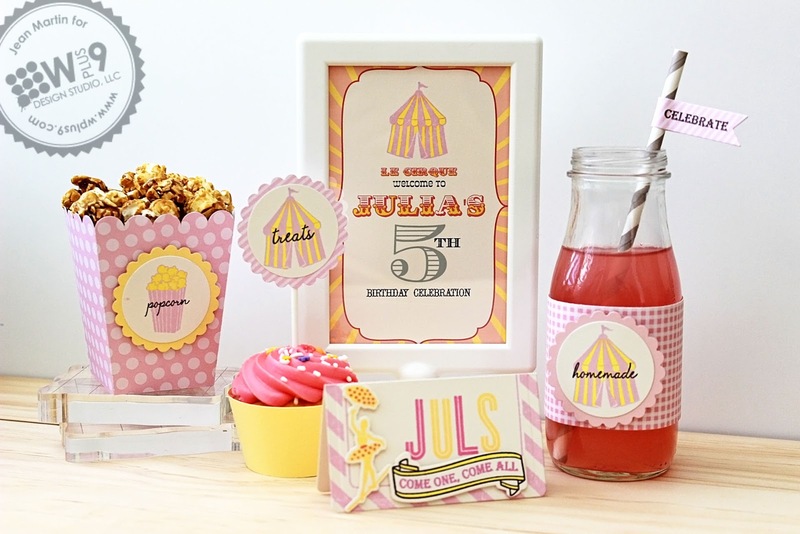 I used Hearfelt Mix and Pile It On to make the banner, and Le Cirque for the rest. 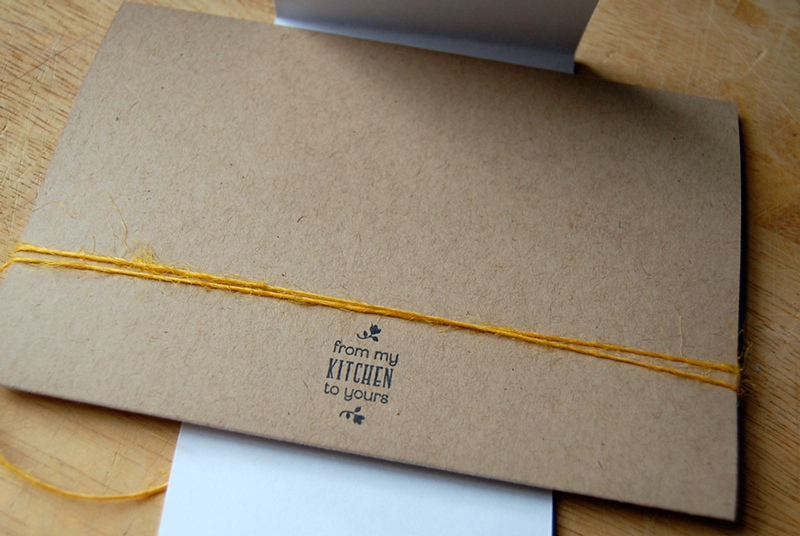 If you have bulky embellishments, you'll need a roomy envelope like the one I've used here. I cut this sturdy envelope using the Silhouette Cameo. Here's a look at the rest of the set. I made tags for party favors, straw flags, bottle labels, place cards, cupcake toppers, and a party sign. 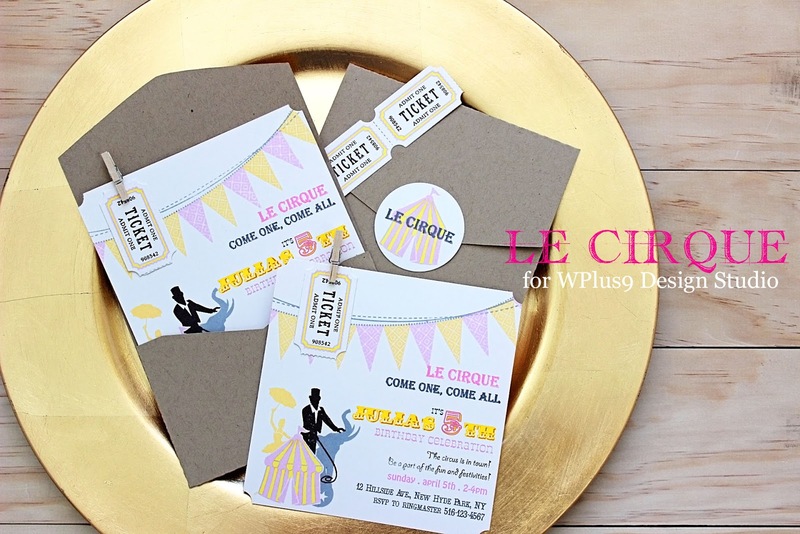 For both the invitation and the party favor tags, I used the masking technique to get the tent, ballerina, ring master, and elephant together that way. 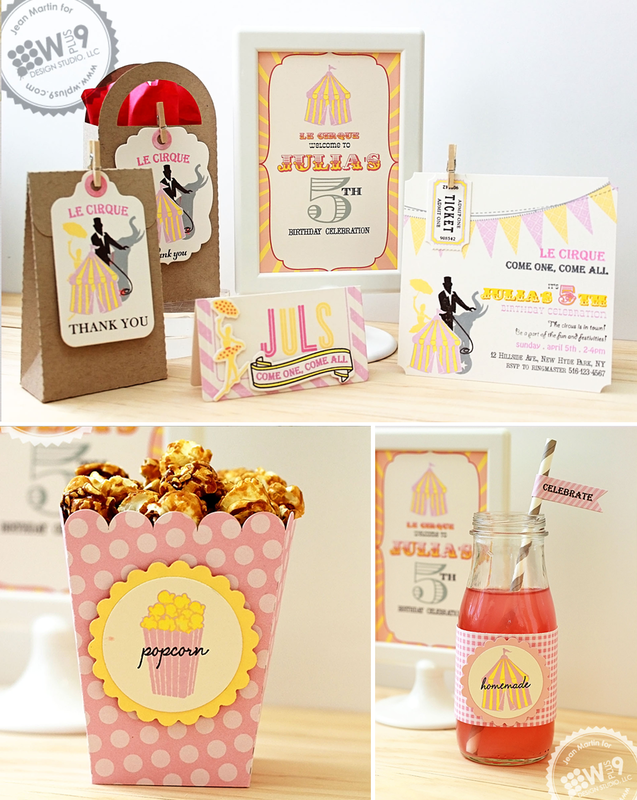 The popcorn box was made with my Silhouette Cameo. I just added the cute little popcorn tag to it. Same thing with the cupcake wrap, I wasn't willing to hand cut cupcake wrappers for a party, considering I would probably need 25-50 pieces of it. But the cupcake topper and popcorn tag were pretty easy to make. You can use your Silhouette as well, but I prefer using dies. The edges always come out better that way. Quick Tip: When apply flags to straws or cupcake picks, make sure to use a strong adhesive like Scor Tape so that they don't fall off prematurely. To create the place card, I stamped the frame from Bitty Buddy Valentines onto the Clear Cut Stackers: Rounded Rectangles die. Then I just scored it across the middle and folded it before stamping and embellishing it. The party sign in the frame is something that I designed in Adobe Illustrator. I made a blank one that you can download below if you'd like. Free Download: You can download the blank Party Sign file here. You can use it on Adobe Photoshop, Illustrator, and Elements. Just type in your own wording in the font that you want. There you go! A DIY party set! This was such a fun project to make. I hope you will give it a try with your next party. 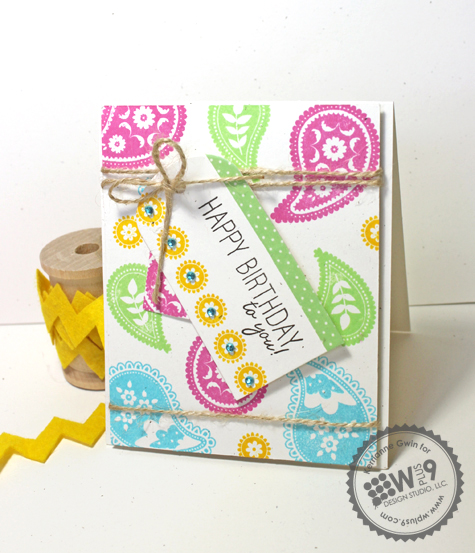 Jill from Greenwood Girl Cards suggested that I make a birthday set: cards, tags, and packaging for my next WPlus9 Design Studio post. This is a start Jill! I'll make birthday packaging my next project when I get back from vacation. 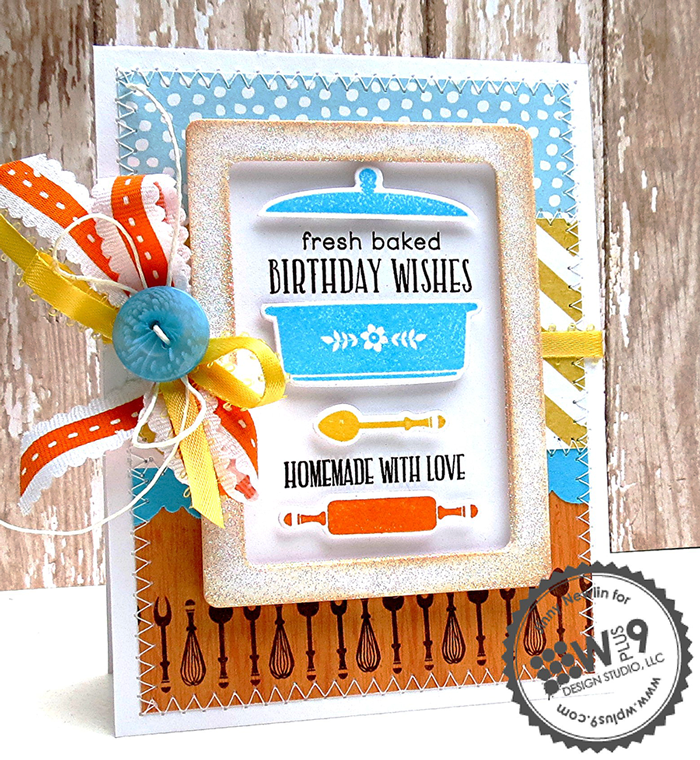 Design team member Kerrianne Bowen is back with another card featuring products from our new release. 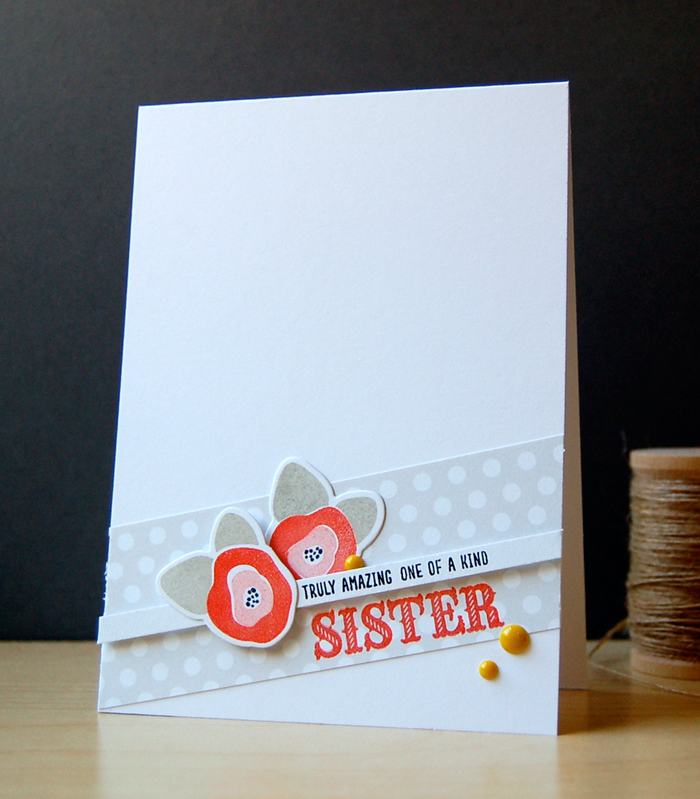 This is a super simple, cheery card. I think the popped up sentiment creates the illusion of the canisters on a shelf. And, the neutral colors make it suitable for a male or female, especially if it's for a male that likes to cook. Hey, most chefs are male, aren't they?! 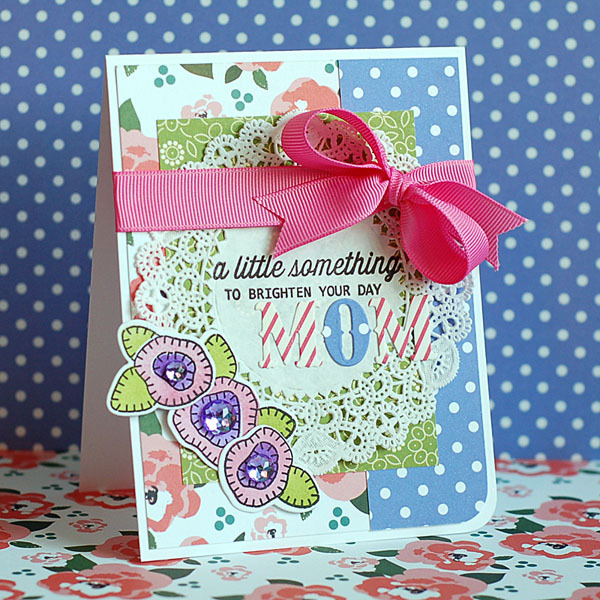 Kerrianne Bowen is back today with two more cards featuring products from our new release. 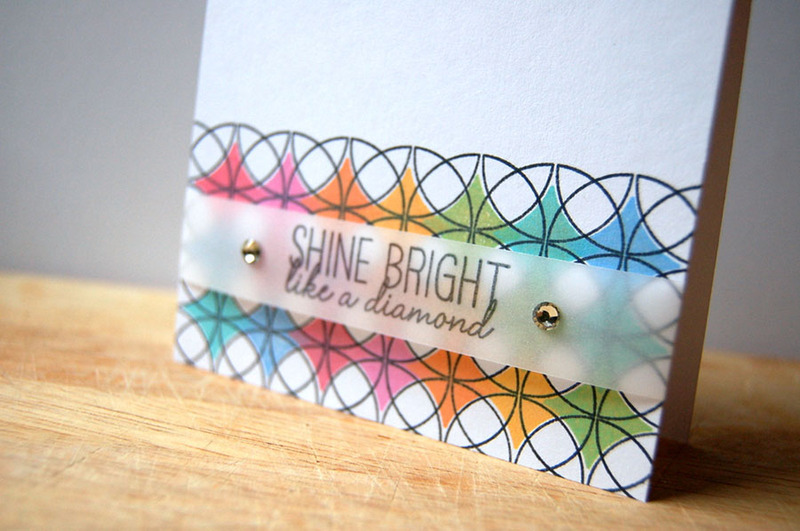 Kerrianne's first card features her signature bright colors and bling. Again, showing how even though these images would more traditionally be associated with a homespun style, they can easily adapt to any style. 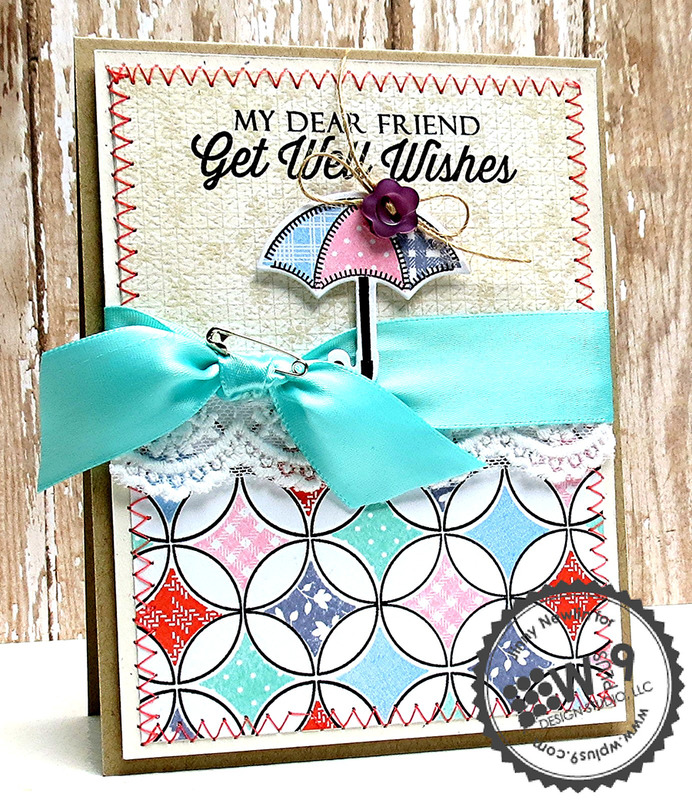 For her next card, she's paired the Folk Art Alphabet with Pretty Patches: Umbrella. I think the font looks wonderful for a baby theme and this would work well for a baby's gift, a welcome baby card, or even a baby shower. Are you ready for some Design Team inspiration? The Wplus9 Design Team is ready to take it away, featuring products from our new release. 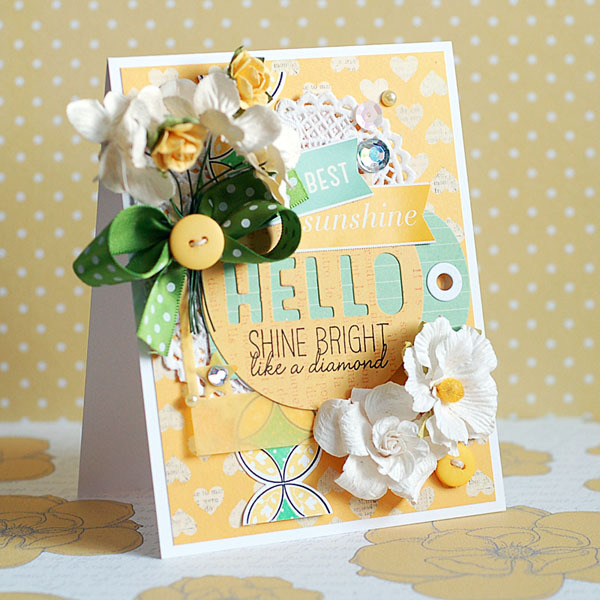 Today, Kerrianne Bowen is here to share some bright and fun cards with us. I really love how Kerrianne chose to use the more folk-styled paisleys from the set, yet used bright colors and kept it clean and simple for both of her cards. Such a great example of the versatility of these images! Here is another spring beauty. I am really loving the unexpected pop of orange lately. When used sparingly I think it freshens up the traditional soft spring palette. How about you? And don't forget the full reveal, where you'll get all the details on everything included in this release! Thanks again, for joining us, for your support and for all of your kind comments! I'll be back Monday with another Monday Mood Board Challenge and the winners from last week.